Momenta Creative | The New TheOverlookCondos.com Is Here! The New TheOverlookCondos.com Is Here! Momenta Creative is pleased to announce the launch of a new mini-site from our web design team headed by Seth Butler! The Overlook at Lansdowne launched this month to showcase the gorgeous condos available from The IDI Group Companies. This site features a scrolling design with mobile-friendly optimization and highlights the key features of this prime real estate development. 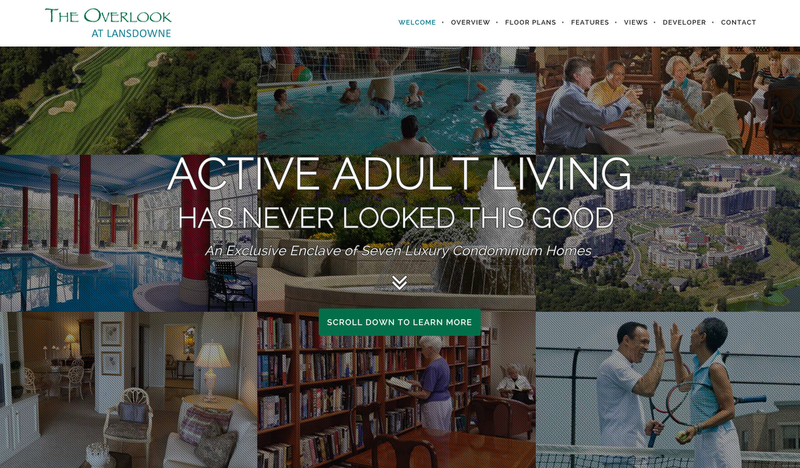 Located at the entrance to Loudoun County’s premier active adult community, The Overlook at Lansdowne is an exclusive collection of seven luxury condominium homes. Each home is located within a rustic contemporary structure that offers one-level living with sweeping views. The condos rest near the gorgeous lakes and greens of Lansdowne’s championship golf course and the rolling wooded setting. Working with the IDI Group management team for The Overlook Condos, Momenta crafted a modern, interactive site showcasing images and renderings of the Lansdowne, Virginia condominiums. On the new site, visitors can now explore special features, get an up-close look at floor plans, and contact The Overlook at Lansdowne’s team at the touch of a button. Congratulations to The Overlook Condos team on your successful mini-site launch! Are you looking for a fast, budget-friendly website build for a project? Contact our team at Momenta, and see how we can help your business thrive!